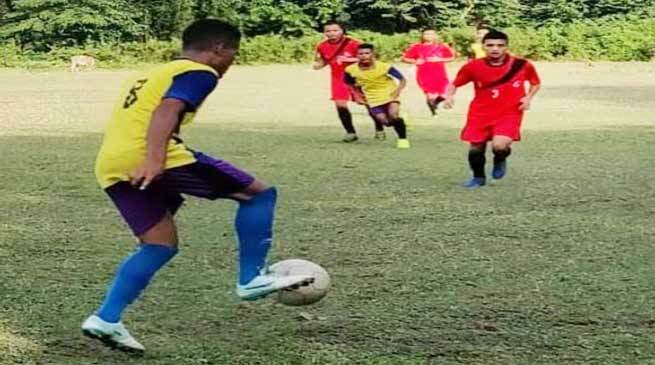 Keeping in sync the sprit of the recently concluded FIFA World Cup, the Chindits Battalion of the Red Horns Division conducted a friendly football match with the local team from Ulubari Milan Sangha, which plays in Baksa District First Division. In the fiercely contested match, the local team won the match with a score of 4-3 against their opponent. The match was played at the club’s ground at Ulubari and drew sizeable local supports in terms of spectators who cheers for both the team. The event culminated with refreshment for the teams and the spectators who were much enthused with the Army’s effort in conducting the event which also provided a forum for the local youth to interact with the troops. The club as well as the spectators were very appreciative of the efforts of the forces to promote sports among the local populace.